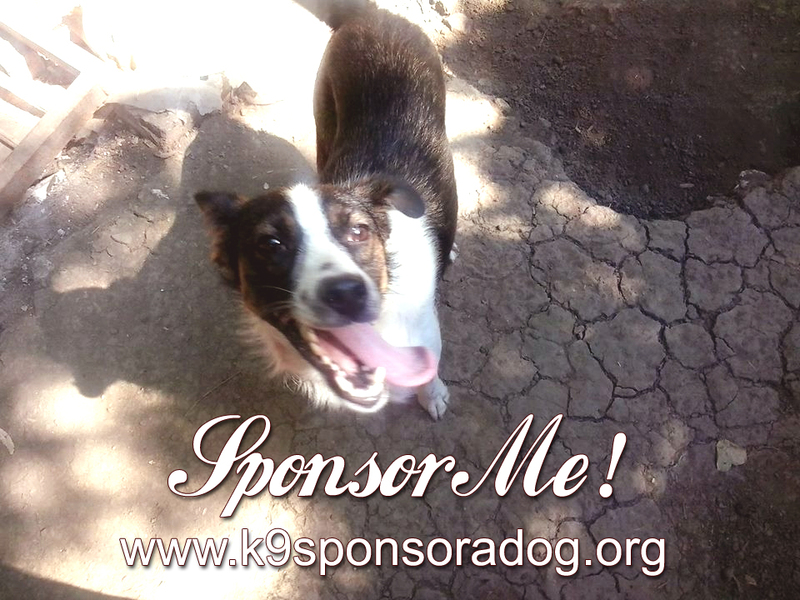 We are challenging 1000 people to donate €5 EURO ~ £4 GBP ~ $6.50 USD per month towards our kennelling in Bulgaria, as well as food, surgeries and other monthly medical expenses so that we can continue rehabilitating the most severely injured and abused street dogs as well as feed the dogs in our care and do spay/neuter. We need to raise a minimum of £1690 / €1985 / $2655 per month to meet our existing commitments – our kennelling and food costs are £1390 / €1625 / $2175 per month, and some of our dogs, such as Peaches, Cinderella, Dharma and Tina will unlikely ever be ready for rehoming due to their fear of humans, yet are happy in their forest boarding hotel. Costs for dogs in rehabilitation (Bobi, Suzy, Hope, Joshua, Roshko, Robin, Tyra, Brownie, Cheri, Jordan and Lucky) are also incurring additional high costs. If you can PLEASE HELP US to keep K9 Rescue going so that we can continue to help the most serious cases in need. Without all of your help, difficult cases like Bobi, Lucky, Joshua, Jordan, Hope, Milli and many, many others can not receive the specialist help that they need. We have a wonderful group of supporters, and with your help, financial support and spreading the word, we can give Bulgaria’s street dogs the second chance in life that they deserve so much. YOU can make a difference!! Please HELP!!!! You can select the amount you would like to donate and also add the name of the dog if you would like to sponsor a particular dog featured in our latest news blog, adoption page or dogs in rehabilitation listed below. Thank you! Monthly Sponsorships via the the worlds leading online fundraising platform. 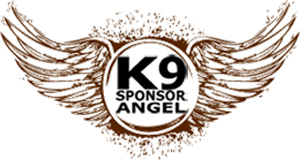 Thanks to our wonderful K9 Sponsor Angels we have £540 / €653 / $895 regular money coming in each month – currently 25% of our current monthly outgoings. Little golden oldie Roshko has had an incredibly tough and heartbreaking life, after being dumped on the streets twice and then kept as a chain-dog in the most appalling conditions where his health deteriorated terribly with skin disease and joint problems. With difficulty walking, vets in Bulgaria performed double patella luxation knee surgery, yet his walking remained quite stiff after recovery. 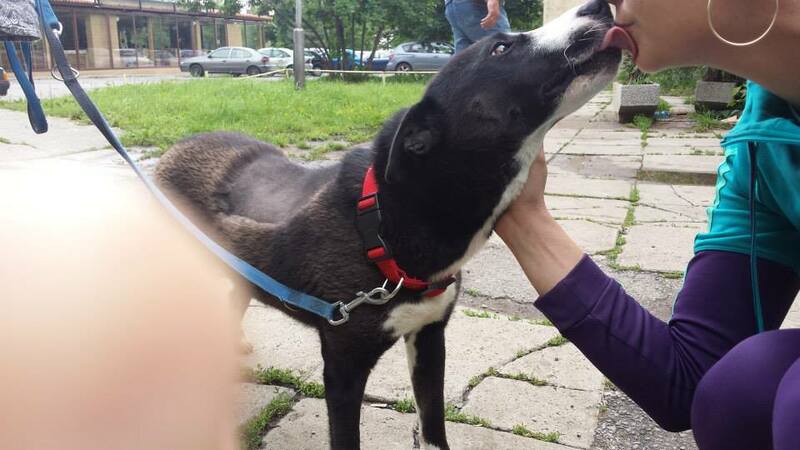 Roshko is now in foster care in the UK where he is being assessed further. UK vets now advise that both knees and now hips are still very painful… with poor range of movement in his hips and knees – possibly osteoarthritis,secondary to the patella luxation or possible cruciate ligament disease or hip dysplasia. With little Roshko’s future still looking uncertain, please help us to help him further. Our fundraising efforts for his original surgery bill have failed completely, with the majority of that bill still outstanding, and now we need to find the vet fees for more investigations, x-rays and pain relief. 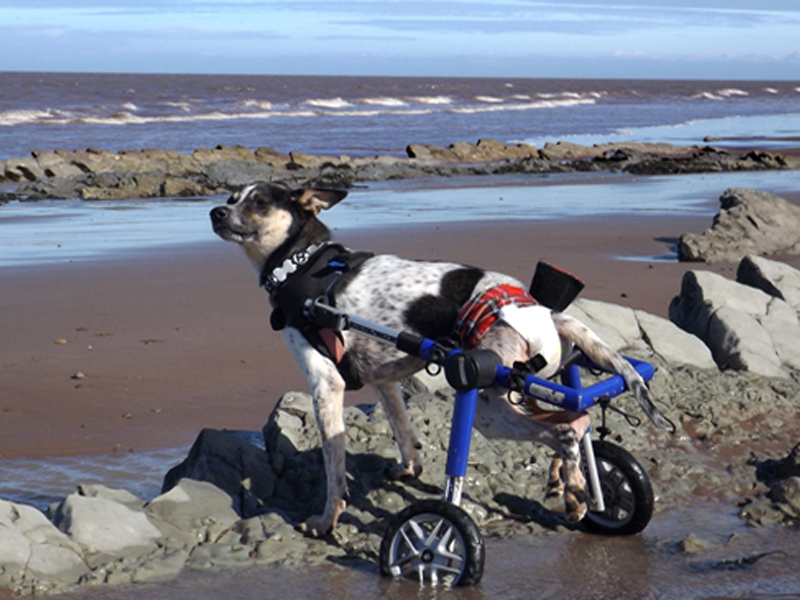 Brownie was found in Spain as a puppy, the victim of a car accident resulting in a broken spine. 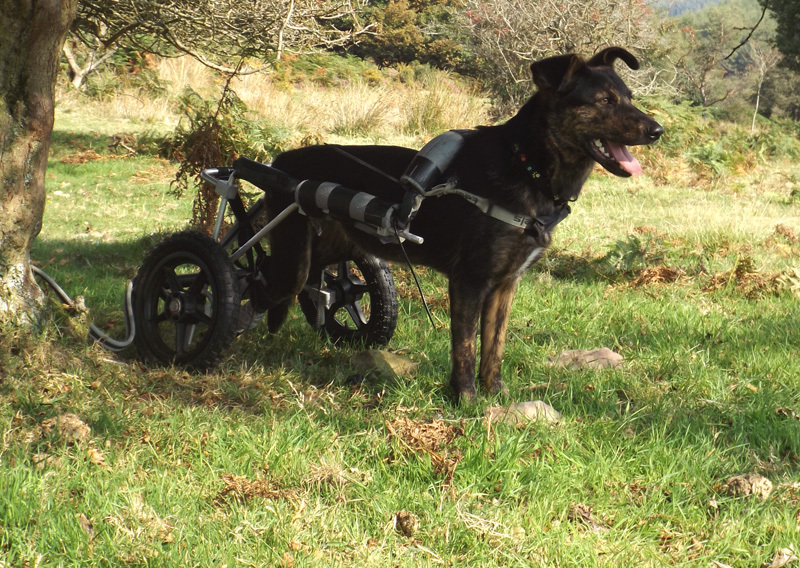 His Spanish rescue preformed surgery, yet could not regain mobility for him, so he was rehomed, with a cart to a family in South Wales, UK. Alas, things didn’t work out for Brownie, and due to ill health of his adopter he needed emergency relocation. 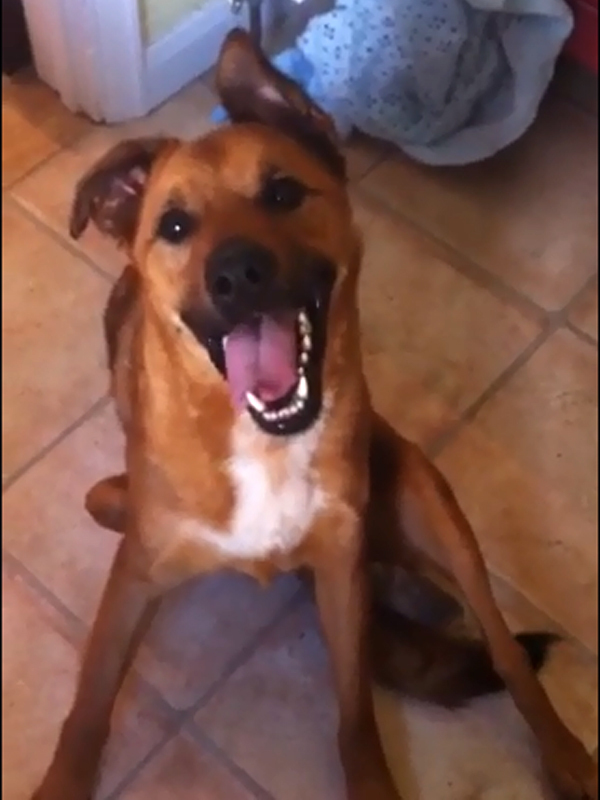 His Spanish rescue tried every avenue to enlist support of a rescue in the UK, yet were turned away, until they were eventually referred to us as disabled dog experts, and we of course could not turn away this sweet boy despite being already completely overstretched. 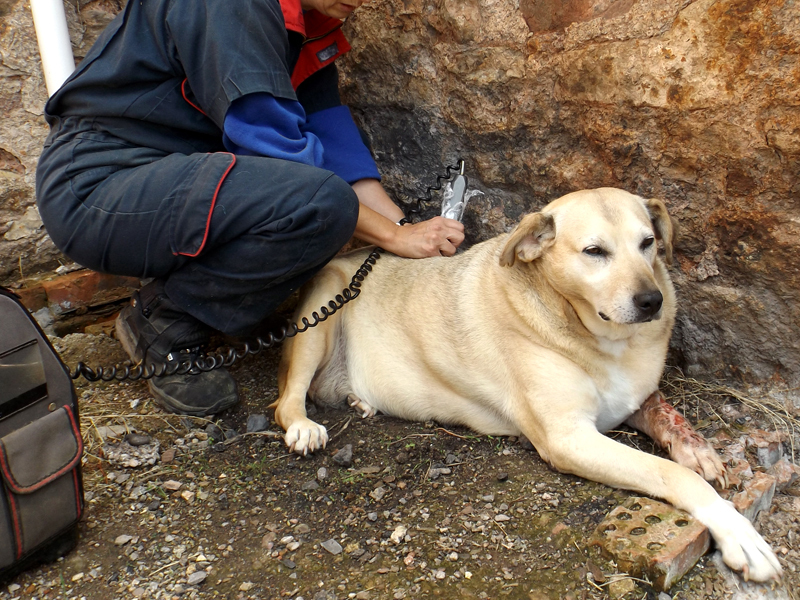 Sweet Bobi was found disabled on the streets of Bulgaria, with terrible wounds to his feet and legs from dragging his legs. Vets say that it is unlikely he will ever walk again, yet our boy has such an incredible zest for life that there is no way we could ever take that away from him, just because he has a disability. Bobi has full sensitivity of his legs now, and to stop the ligaments from becoming contracted and painful through lack of use (which can happen) he needs regular physiotherapy, as well as permanent protective bandaging of his feet as he has weakness there from his life on the streets. 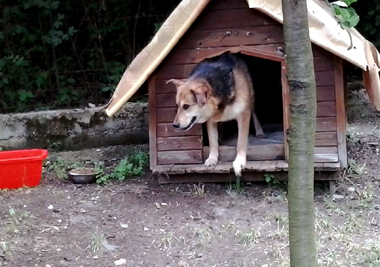 Golden Oldie Tyra was rescued several years ago by our friends at the ARS shelter in Sofia, Bulgaria. They were unable to get to the bottom of Tyra’s leg disease so we offered to take her and she travelled to her foster home in the UK in 2013. 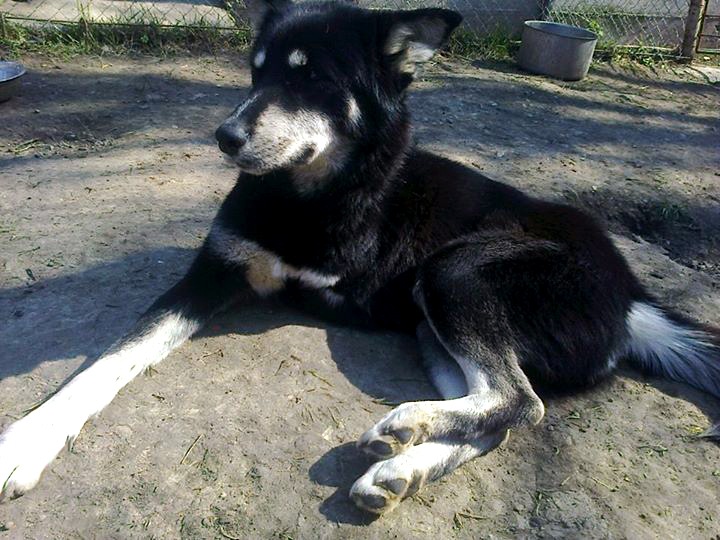 Alas, despite healing her leg several times, we are still battling this for her…. many different diagnoses have been given, by many different vets; latest opinion is that it is a lick granuloma that we are currently treating with Low Level Laser Therapy (LLLT). Tyra also has bladder, pelvic and spinal issues that she is having physio and LLLT for. 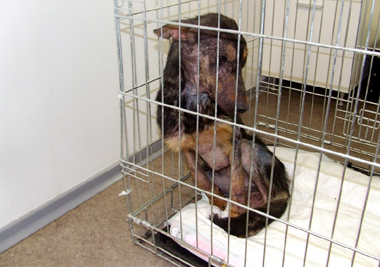 Sweet Hope was shot in the spine and left for dead on the streets of Bulgaria at just 4 months of age. Since then she has regained full sensitivity of her limbs, yet still needs extensive therapy to recover the muscle wastage in her legs before she has any chance to walk again. As with other disabled rescues, in addition to her vet and therapy costs, Hope’s ongoing needs for diapers, protective bandaging, ointments and other essential items are costly so we are desperately looking for some dedicated sponsors for her! 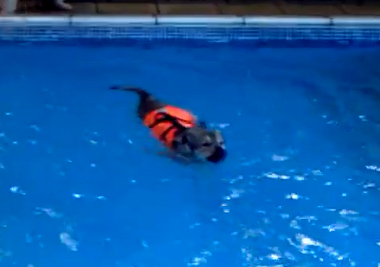 Please see Hope’s story here …. 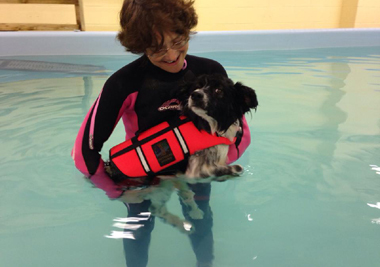 Our dear little Epilepic girl Robin was rescued after cruelly being thrown from a moving car. 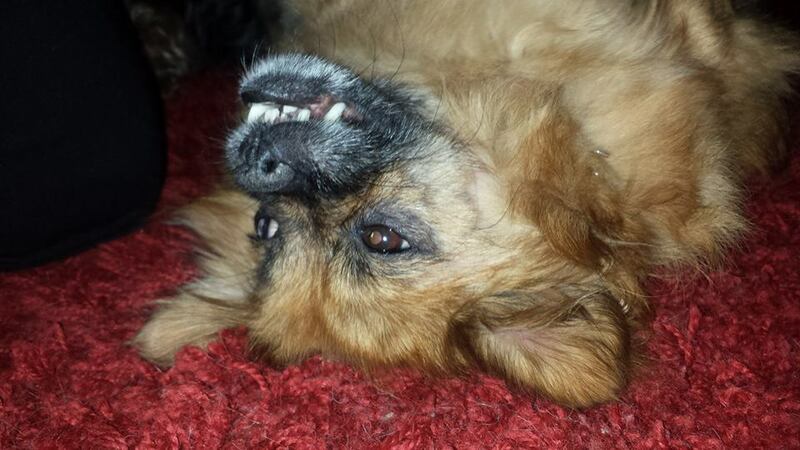 After being nursed back to health in Bulgaria, Robin was transferred to foster care in the UK, where she still needs a lot of dental work done, as well as further tests for her epilepsy as her medication leaves her lethargic. Robin’s Epilepsy medication alone costs £45 / 57 euros / $72 per month and we are desperate for help with her ongoing care. Cheri has made a miraculous recovery since her surgery to remove the bullet from her spine, yet one leg still refuses to recover completely. Cheri is now in foster care in the UK and we would like to start hydrotherapy for her as soon as possible to complete her recovery. With donations at an all time low however, we desperately need sponsors for Cheri before we can start her recovery programme. Please help us to help her! Please see Cheri’s story here …. Joshua’s ongoing therapy is costly so Joshua would love it if he could have some of his very own dedicated sponsors! Now he is in foster care with his sweetheart Raya, where he has been having hydrotherapy, chiropractic treatment and physiotherapy as well as a special diet to help build muscles. 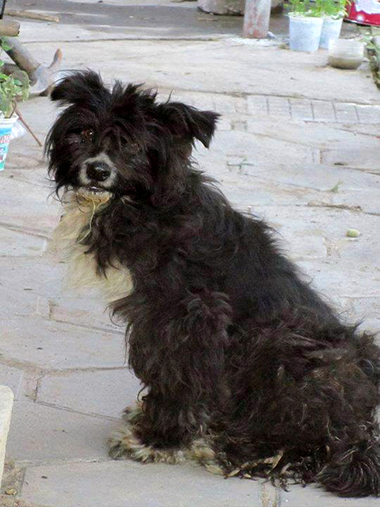 Jordan was rescued from the streets of Bulgaria with a badly injured front leg which needed to be amputated. As if that wasn’t enough to contend with, Jordan was also in the early stages of Ehrlichiosis, a life threatening form of Tick Borne Disease. Our vets successfully saved Jordan’s life, yet the Ehrlichiosis has caused an Ocular lesion and Uveitis of his left eye, so while he waits for his new family, Jordan is undergoing long term treatment to ensure the sight in his eye does not deteriorate and also some therapy as we’ve established he still has some residual pain from the original accident. Peaches was rescued from a notoriously harsh dog pound in Bulgaria found to be suffering from pneumonia and low immune system as well as demodectic mange and extreme fears due to her treatment at the pound. With her skin condition now almost healed, Peaches is on the slow journey to learning to trust people again, she loves her vet Dr Georgi, yet is still very nervous of everyone else and can not be touched.